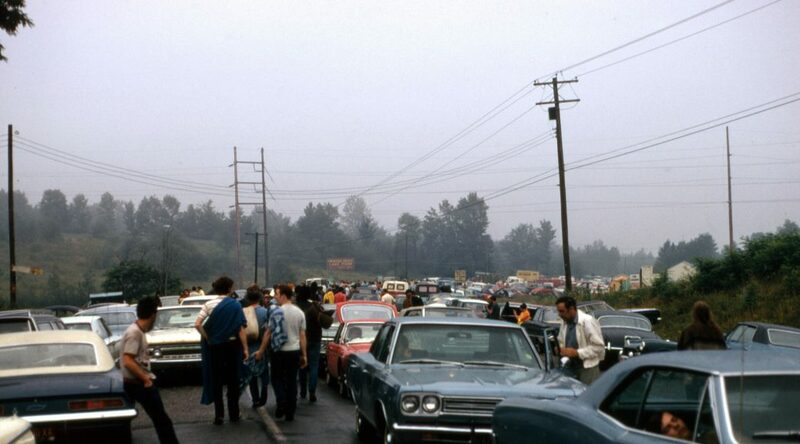 Whether Woodstock Ventures was ready or not, the first day arrived. As I’ve indicated, there were thousands of people already on the field by Wednesday and the organizers realized that without booths that selling or collecting tickets was unlikely. They would dance with who brung them. The following is a listing of who played that first day, what they played, and how long they played. Keep in mind that while the organizers were well-organized (despite the myths), keeping track of times and players was not high on anyone’s list (insert joke here). The following seems to be accurate, but not definitive. Swami Satchidananda addressed the audience and spoke about peace (6 PM). Sweetwater started at 6.30 pm; played for 45 minutes. Bert Sommer started at 7:30 pm; played for approx 40 minutes. Tim Hardin started at 9 pm; played for 30 minutes. Ravi Shankar started at 10 pm; played for 40 minutes. Melanie played instead of Incredible String Band. She started at 11 pm; played for approx 20 minutes. Arlo Guthrie started at 12 midnight; played for approx 40 minutes. Joan Baez started at 1 am; played for approx 60 minutes. I was tripping my brains out all day . It was Owsly Purple Double Dome. I had a bad reaction to it. I was in and out all day. Some performers I remember quite well others not at all . Needless to say it was the last time I did acid for at least a week. Restraint is always a good choice. Thanks for sharing your story. Loved Melanie. Too bad she ruined herself by giving her heart to Scientology.